L-Section launcher with holes for locating two 19mm. diameter steel balls which act as projectiles. 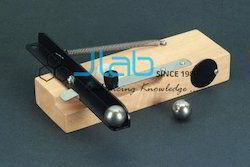 Launcher is released by push button and projects one ball forward while allowing the other to fall freely Launching mechanism mounted on wooden block, 180x60x30mm. which may be clamped by bench and has a convenient storage pocket for the balls. Complete with two steel balls. L-Section launcher with holes for locating two 19mm. diameter steel balls which act as projectiles. 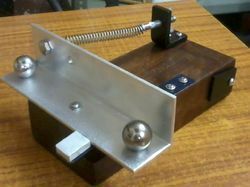 To Demonstrate That A Body Impelled Horizontally Will Have Vertical Acceleration Same As That Of A Body Falling Freely.Two 19mm Dia Steel Balls Are Launched By Releasing A Push Button .This Projects One Ball Forward And The Other Falls Freely.This Mechanism Is Mounted On A Wooden Block ( 180X 60 X 30 Mm ).